The new MacBook is really very nice. I’ve been waiting for the MacBook refresh for a few months now, so I was paying close attention when they were released on Tuesday. I bought one on Friday, and am very happy to be writing this post on my new machine. About a year ago I bought the new iMac when that line was refreshed. A few months later I bought a eyeTV hybrid so I could use our 24″ iMac as our TV and PVR. But I never hooked it up because we didn’t have an extra computer to use. So I moved my iMac upstairs and pulled down our circa ’94 television and set up my iMac in its place. Took about five minutes and it was up and running. So easy. Now we truly have an integrated entertainment centre, with our TV, music, Internet, photos and homemade movies all on one system. I can use our spare firewire drive for both our Time Machine, as well as our PVR to record our favourite shows (we have still been using a VCR, so we’re slightly behind the times). Now we have our iMac in our home office and bought a cheap extra monitor to get a little more screen space (my only gripe is that the new Mini DisplayPort adaptor for external monitors wasn’t released to Apple Stores at the same time, so I have to wait before I can hook up the monitor). Bought a wireless Apple keyboard and mouse for the iMac just to round things off. It’s a big upgrade, but it all seems to be running extremely well. 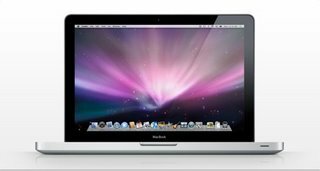 I’m not much of an early adopter and have never had a Mac laptop before, nor more than one computer at a time. Hard to justify the expense, but we’re pleased with the outcome. I can already tell that my son Ivan will grow up with an entirely different sense of TV and movies than my wife or I did. YouTube, television, DVDs, our home movies… what’s the difference anymore – it all comes through the same box. He doesn’t understand why television can’t play on his timeframe, but on its own schedule. True enough. 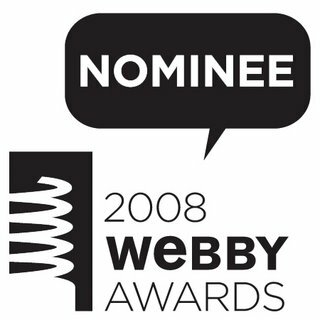 I am so pleased and excited to announce that ChangeEverything.ca was nominated for a Webby Award. This is such an incredible honour, and follows on the heels of being an Official Honoree last year. Please vote for ChangeEverything.ca for the Webby People’s Voice Award. Perhaps you’ve heard of some of them. It is mind-boggling to be nominated against some of the biggest developments in social networking of the last year or two. Amazing also to be the only company-created social network, up against a bevy of startups. Equally impressive is the lineup of judges who selected the nominees and will select an ultimate winner. The Academy is an intellectually diverse organization that includes members such as musicians Beck and David Bowie, Internet inventor Vint Cerf, political columnist Arianna Huffington, Real Networks CEO Rob Glaser, “The Simpsons” creator Matt Groening, R/GA Founder and Chairman Robert Greenberg, Virgin Atlantic Chairman and Founder Richard Branson, Crispin Porter + Bogusky Partner and Chief Creative Officer Alex Bogusky, and The Weinstein Company Co-Founder Harvey Weinstein. Members also include writers and editors from publications such as The New York Times, Wired, Details, Fast Company, Elle, The Los Angeles Times, Vibe, and WallPaper. The 11th Annual Webby Awards received over 8,000 entries from over 60 countries and all 50 states and generated over 750 million media impressions worldwide. It is pretty much exactly two years since we started developing the site from a concept, and so rewarding to see where Kate has nurtured and engaged the community of over 3,000 registered users. I am also heartened that we are the only socially responsible community in the running. Proves you can do well by doing good. UPDATE: I added a link to where you can vote for ChangeEverything.ca for the People’s Voice Award. 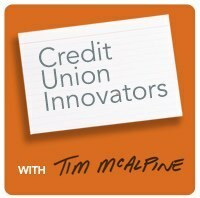 Listen to the Credit Union Innovators podcast. The format of this and future episodes will be interviews and conversations with people that are doing good things for the credit union movement. Credit union leaders and employees and partners to the movement including vendors, technologists, strategists, designers, specialists, marketers, developers, speakers and members. Anyone with passion for the credit union movement and with something to say. The really great news is that the first podcast features Gene Blishen of Mount Lehman Credit Union. Gene is an amazing inspiration to me. He is an incredibly important resource for the entire credit union movement, and his credit union is a real pillar of the community. He understands the mission of his CU perfectly and keeps his focus exactly where it should be: on his members. He’s well worth listening to. Podcast 01: Credit Union Innovator Gene Blishen. Or subscribe to it in iTunes. ChangeEverything.ca is a 2007 Digital Marketing Award winner. I am so pleased to learn that ChangeEverything.ca won a Certificate at the 2007 Digital Marketing Awards in the category of Website: Financial services. The Digital Marketing Awards represents the best of interactive marketing in Canada. The awards are produced by Marketing magazine, and judged by the industry. The mandate of the DMAs is to inspire many by rewarding few. Those few will be chosen for their innovation and creativity, and for leveraging the interactive environment to it’s full potential. The jury is impressive, and includes my friend Michael Seaton. It’s so nice to see ChangeEverything.ca doing good things in the community, while getting recognized by the industry. Feels good. Tomorrow, Wells Fargo will launch its newest social media venture, Center Stage in the Rose Parade. It’s a super funny idea: They have different musical genre takes on the “The Wells Fargo Wagon” song from “The Music Man.” Anyone can create their own music video to any of the five versions, and submit it to the site. The Grand Prize winner could have his or her video highlighted in our Wells Fargo national TV advertisement during the Tournament of Roses Parade and on wellsfargo.com. That’s a lot of eyeballs. We’re also awarding two (2) 8GB Apple iPhones, as well as ten (10) 1GB Flip Video Ultra Cameras to other lucky winners. I also noticed that the platform they’re using is a viral video platform by local Vancouver digital agency, Invoke Media whom I’ve worked with a couple of times over the last few years. In the end, this gives Wells great content, helps them identify some brand enthusiasts, lets people play with the brand and humanizes the company. Plus free content. Nicely done, which is hardly a surprise considering how amazing their VP of Social Network Marketing is, Ed Terpening. They just keep rolling out interesting projects, and no one else seems able to keep up in the banking industry.